Sam and I are watching Edward Scissorhands. I got it from Netflix on Blu-ray, high-definition being the primary reason I queued it up on my list in the first place. 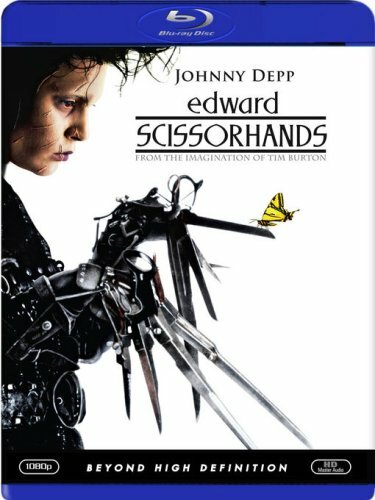 I’d forgotten—or lacked the ability to appreciate—the stark contrasts that Tim Burton put in place, a cinematic device to set the tone(s) for the rest of the film: even less than 45 minutes into the film, Edward is least alien and most normal of the whole lot of them. After all this time no one can argue the xenological, A Wrinkle in Time-ish qualities of American suburbia. Even so, Tim Bur­ton dials the suburban colors towards pastels—houses, clothing and people. Edward, as you probably recall, lives a black and white (and in one scene, lavender) existence and nothing appears real until Dianne Wiest walks into the yard of the “castle up on the hill”. The only character that has withstood the test of time is Esmeralda, because she’s a fire and brimstone creature spouting ugly Christian doom and gloom within a Brimstone and Treacle story. You could lift her out of this 1990 (!!!) movie and put her in almost any drama today and not have to change a single syllable. And that’s just sad. All affected they are, except for Edward (and a very vul­ner­able Vincent Price as The Inventor)—and not because he’s alien to suburbia but rather alien to personal conceit and politesse. Personality is everything that’s false in a human, everything that’s been added on to him and contrived. It was this quote in retrograde that inspired me to write this entry, a happy serendipity. You have to appreciate both Shepard’s economy of words and Burton’s gamboling imagery equally, don’t you? Personality can only exist among compatriot creatures; everything else it kills. Nothing strips away personality like the power in a poignant memory.